Greg Sorbara, the Province’s Finance Minister, was at the Spec last week to speak to the Ed. Board. (It’s taken me a while to get around posting this.) I like the guy. He’s smart, friendly, funny, and trustworthy. His boss, the Premier, is friendly in person, but when he gets talking his aww shucks attitude and his tendancy to blow off government falterings with statements like “our work has only just begun”, and “we were handed a mess by the previous Tory government”, it gets to be a bit grating. Sorbara gives similar message points, but he seems to be more genuine when reflecting on the challenges of government. If it were my choice Sorbara would be leader of the Liberals and Premier of Ontario — but it’s not the case so the man will continue to be puppet master to Dalton McGuinty. Here Hamilton is shafted as Sorbara caters to the 905 area around Toronto taking advantage of social service pooling. Here Sorbara nurses the imposition of the Health Premium in the Liberal’s first Budget. Here Sorbara and McGuinty are shown doing very little as homeowners get burned on their property assessments. It’s been a while since I’ve done one of these cartoon process thingys. This one was inspired by the work of the great James Gillray. I created one similar to the 18th century style when I drew on the ongoing negotiations over the Caledonia standoff. Dalton McGuinty came to the Hamilton Spectator and I joined with others from the editorial board to listen to what the Premier had to say as the province approaches an election this coming October. Visits like these let me act like I’m some sort of portrait artist. This was the third visit he’s made to the Spec in the last 4 or 5 years. You can watch some highlights of the meeting in this nice little video featurette (you can see me earnestly drawing the above sketch at about the 1 minute 8 second mark as columnist Andrew Dreschel throws out a question.) The Premier seems prepared to dump bucket loads of cash on Hamilton, which isn’t all that surprising with an election looming. He threw out an intriguing challenge for Hamiltonians: What do you want? The Premier did not wear a red tie. It was purplish with a polkadotty type of design. It was loosened, and he was without a jacket, and of course his sleeves were rolled up. Upon asking the Premier his choice of beverage my boss, Kevin Cavanaugh, followed through with a request for water by handing Mr. McGuinty a bottle and saying, “here’s some truth serum”. The Premier mentioned Randle Reef 3 times during the meeting. Randle Reef is better known as a huge blob of toxic goo in Hamilton harbour. It’s one of those perpetual issues of this city that we live with but mostly don’t know what to do about. It’s interesting how it seems to be on top of mind for Ontario’s head honcho. While I’m name dropping I should do some nation dropping as well. Part of the fun of going to France is bragging about going to France. That’s where I’m off to for the weekend. I’ll be back in the papers next Wednesday. 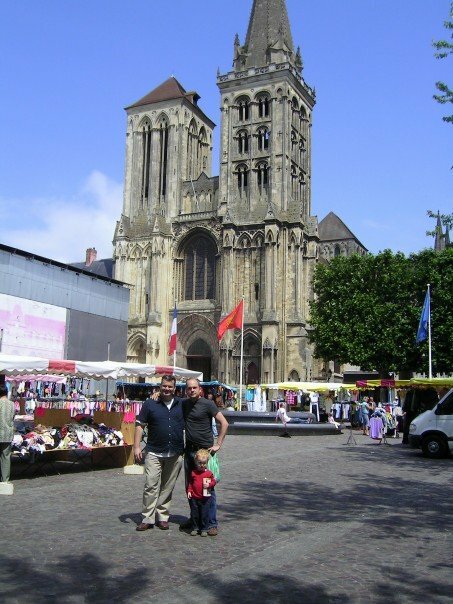 UPDATE: Here I am in Liseaux, France with friend Christian Hyde and his son Nowe. Aware that CFLs contain potentially hazardous substances, Bridges called her local Home Depot for advice. The store told her that the CFL contained mercury and that she should call the Poison Control hotline, which in turn directed her to the Maine Department of Environmental Protection. The DEP sent a specialist to Bridges’ house to test for mercury contamination. The specialist found mercury levels in the bedroom in excess of six times the state’s “safe” level for mercury contamination of 300 billionths of a gram per cubic meter. The DEP specialist recommended that Bridges call an environmental cleanup firm, which reportedly gave her a “low-ball” estimate of US$2,000 to clean up the room. The room then was sealed off with plastic and Bridges began “gathering finances” to pay for the US$2,000 cleaning. Reportedly, her insurance company wouldn’t cover the cleanup costs because mercury is a pollutant.